MORE ABOUT EDF: "WHAT DOES A DUAL DO?" The Model EDF is a dual flow seal water monitor with many of the same design features as the ESKO ESF seal water monitor. In typical applications, the EDF is designed to give an indication of water as it enters and as it exits a double mechanical seal to ensure the seal is constantly cooled and lubricated. These meters are often mounted on a stand (also supplied by ESKO) near the pump. Process water circulates into the meter via inlet and moves through the meter to the mechanical seal to cool and lubricate it. 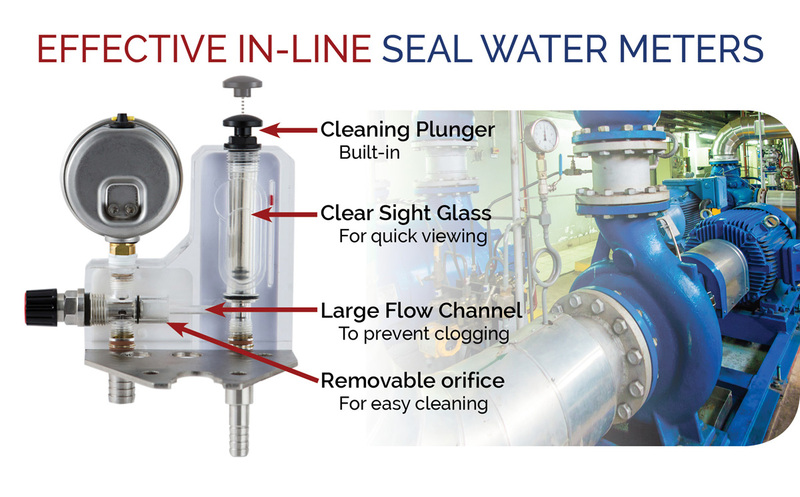 The flow tube on the right side provides an indication of water flow going into the seal. After exiting the seal, water circulates back into the second tube of the meter, giving an indication of the water flow leaving the seal. The second tube (on the left) provides an indication of water flow exiting the seal to an effluent channel or recirculating into the process. An optional check valve is available to keep water out of the seal at the exit point. A flow level alarm sensor can alert operation personnel or trigger interlocks when, water flow varies beyond set limit(s). Any process industry with pumps will want to ensure that their mechanical seals are cooled and lubricated with the correct amount of water. An alarm sensor can be easily mounted onto the integral sensor slot on the back of the ESF or EDF meter block, behind the indicating tube. The EDF can accommodate two alarm sensors if both low or high flow alerts are needed. Alarm setting is done by adjusting the position of the sensor(s) in the slot. A back-pressurizing valve is used to optimize water flow to a double mechanical seal. Reducing the discharge of water builds up pressure across the mechanical seal face. The hand knob on the back-pressurizing is used to adjust the volume of water leaving the seal. The Model EDF comes standard with a built-in pressurizing valve.